I like Jimmy Fallon. It’ll probably be years before I can once again consistently take in late night talk shows, but I look forward to clips from his new duties at the helm of the Tonight Show. After all, he’s the guy who did this and this. Javier Baez has arrived in Arizona, and he discussed the year ahead as humbly as possible, saying things like “taking my time,” “I’m still learning,” and “I’m going to work on my defense.” You can see initial interviews here, here, and here, for example. 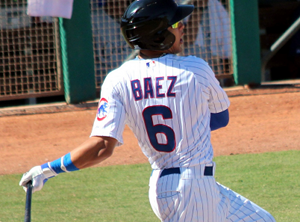 In the end, the story remains the same: Baez is a stud and will probably be a ton of fun to watch in Spring Training, but he’s starting the year at AAA Iowa. And although he might see time at other positions in the Spring, he’s staying at shortstop for now. Rinse. Repeat. And wipe up your drool. For now, Rick Renteria says the plan at third base is to mix and match. (Patrick Mooney) That’s the obvious right answer at this point, particularly given the fact that we don’t yet even know for sure what the roster is going to look like. Luis Valbuena and Donnie Murphy are the incumbents at the spot, in a platoon, and Mike Olt will remain at third base for Spring Training. He’s about as wild card-y as it gets, with even the Cubs appearing to concede at every turn that they don’t know what they have in Olt until he sees live pitching in game situations. 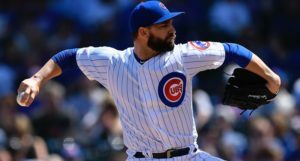 And, even then, I have to wonder: will Spring Training be enough to convince the Cubs in either direction? 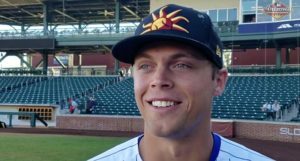 If not, the Cubs will have to do some serious lineup massaging to make sure he gets regular at bats at AAA Iowa, with Christian Villanueva at third and a potentially crowded outfield picture. Olt may have to dust off the first base glove and/or do some work at DH. Jeff Samardzija tell Patrick Mooney he was “blindsided” by Ryan Dempster’s decision to sit out the 2014 season, which I assume was just a coincidence, and not a veiled reference to Dempster’s “blindsided” comments from the 2012 Trade Deadline. Bruce Levine says Welington Castillo has put on 10 pounds of muscle. 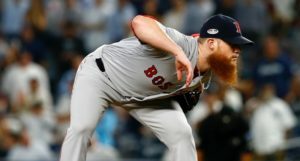 I’ll reserve comment until I see him in action, but I will admit that I heard “10 pounds” and thought about Castillo’s knee surgery at the end of the season, and I got a little nervous about the offseason activity. Castillo could stand to add a little pop in his bat, so maybe adding some weight will prove to be a good thing, so long as it doesn’t cost him any quickness. A Q&A with Cubs pitching prospect Kyle Hendricks. Chicago Magazine’s annual list of the most powerful people in Chicago is out, and Tom Ricketts (48) and Theo Epstein (100) slipped considerably from their spots last year, which, shrug. 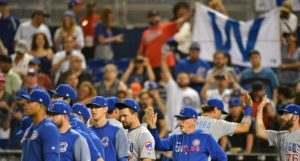 The Cubs are crappy, and have been crappy for a while now. That kind of perception is understandable. If/when the Cubs start winning consistently? That – and so much else – changes rapidly. Jerry Reinsdorf, by the way, was 11th, and Rocky Wirtz was 6th. Cubs Minor League Pitching Coordinator Derek Johnson was on the Top Coach Podcast. Vine Line on the story of Weeghman Park, the field before it was Wrigley Field. Previous PostPrevious post:Orioles Reportedly Agree to Terms with Ubaldo Jimenez – Jeff Samardzija Impact?